Emotional Intelligence (EQ) Thought Leader. Leadership, Performance and Change Expert. An internationally renowned thought leader on the subject of Emotional Intelligence (EQ), leadership, performance and managing under pressure, JP is one of the highest rated lecturers at Kellogg School of Management’s Executive Education Program. ​He serves as advisor to numerous Fortune 100 companies, including long-term consulting arrangements with Johnson and Johnson, PWC, Goldman Sachs, HSBC as well as Olympic medal winning athletes. JP’s training includes Harvard Medical School’s Mind/Body Medical Institute. Every year, JP speaks with individuals and leaders on over five continents, helping them to improve their overall performance and understanding of emotional intelligence. He is an expert in performing wonderfully under pressure and is one of the world’s most highly sought-after keynote speakers on the topic. 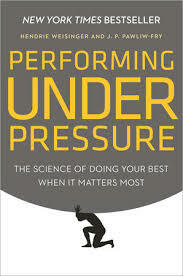 JP co-authored the New York Times bestselling book, Performing Under Pressure: The Science Of Doing Your Best When It Matters Most, with noted psychologist Hendrie Weisinger. JP is also a performance coach to Olympic athletes and business leaders. He melds innovative research with powerful inspiration to create thought-provoking and moving keynote presentations. ​An expert in performing under pressure, he is one of the world’s most highly sought-after speakers on the topic. Formerly, JP taught executive education at Queen’s University Executive Development Center as well as the Kellogg Graduate School of Management (ranked number one, worldwide). He is now a contributing member of IHHP’s research team, a group that brings rigor to understanding what allows some leaders’, individuals or organizations to perform more effectively under pressure to drive meaningful results on how they can ‘be their best when it matters most’. ​J.P. has coached or worked with senior leaders at a number of Fortune 100 companies. as well as Olympic and NBA coaches, US Army and Navy, the CIA to name a few. Performing Under Pressure: The Science of Emotional Intelligence Why do smart people fail? Why do technically brilliant individuals have trouble managing others and collaborating on a team? What they lack is a critical level of Emotional Intelligence (EI) and the ability to manage their emotions and others when they are under pressure. In the EI program, you will learn the research and brain science of emotional intelligence, enabling you to lead teams more effectively and increase your own performance. You will become a student of human behavior: understanding what your brain does under pressure and how that affects your decision making and your impact on others. This program will teach you the brain science of Emotional Intelligence and strategies to manage your emotions so you can be at your best in your most difficult moments. Most Nobody performs better under pressure. Regardless of the task, pressure ruthlessly diminishes our judgment, decision-making, attention, dexterity and performance in every professional and personal arena. In this program, you will be introduced to the concept of pressure management, offering the latest science on how your brain responds under pressure, and many empirically tested strategies to help you overcome the sabotaging effects of pressure. This program provides insight into how pressure impacts the cognitive part of your brain. Using this insight, you will learn proven strategies to enable you to perform your best when is matters most. People want to build strong relationships with their managers, teams, and peers: they want to bring their ideas and concerns to the table regardless of who is in the room. To achieve this, difficult conversations need to take place. Unfortunately, under the pressure to drive results, people often forget the importance of building trust; they avoid the conversation entirely or they ignore the Last 8% of the Conversation™. What is the Last 8% of the Conversation? At the end, when the pressure increases, many people avoid (sometimes unknowingly) the last and most important part of the conversation – the part that really needs to be said. This program will arm you with insights and communication strategies to have conversations that drive results and get to that last 8%, even in pressure filled moments. Avoiding the difficult costs us. When we avoid what is difficult – the challenging tasks, relationships or change that we all face, we become less effective and the business and our people suffer. Successful leaders are those who learn to push through the anxiety, the discomfort, in order to approach the difficult and do the right thing. In fact, our research shows leaders who ‘approach’ the difficult outperform those who ‘avoid’ by 21% (and not insignificantly, become happier)! If everyone on your team performed 21% higher, what impact would that have on your organization and your customers? If you’re a leader who’s struggling, take heart: you can learn how to approach, rather than avoid the difficult. Based on seven years of research at IHHP, the Power of Approach identifies five key traits that help leaders consistently perform at their best, under even the most demanding circumstances. This compelling keynote will reveal these traits, show how the ‘micro decisions of leadership’ silently sabotage or enable leaders, and provide new ways of thinking that will enhance your learning capacity, leading you to sustained performance and well-being. Is there a leader or team member who continually encounters resistance to their ideas, suggestions or actions because of their reputation? Do you have a reputation that opens doors, or closes them? Most leaders don’t understand that their reputation is an invisible force that shapes every decision, and effects how people listen and respond to their ideas. Like most people, you may be unaware of the role pressure plays in forging and reinforcing a reputation; the brain encodes information differently when we are under pressure meaning that what we do in pressure moments has an outsize influence on the reputations that forms in other people’s minds. This program will help you develop a reputation that allows you to have influence and drive change across your organization. Is your team up to the Olympic standards? Do they want to play at the highest levels in the world? Do they know the secret? Challenge your team to get to the next level of performance with a riveting keynote from someone who knows what it takes to win at the Olympics. Dr. JP Pawliw-Fry offers something truly different – knowledge of the secret that allows some individuals to get to the highest level of performance and the ability to deliver this message in a way that leaves audiences wanting more. He has coached athletes to Olympic glory and taught leadership executives at the number one ranked executive education programs in the world (Northwestern’s Kellog Graduate School of Management). In other words, he studies athletes and business people at the highest levels of success and delivers a message that incorporates the best of both worlds to help your team achieve your own Olympic victory. In this powerful keynote, your team will discover: • The one thing that differentiates Olympic winning performance from the average • How to adapt the mind-set that characterizes success at the highest levels • How to manage the need for results and the pressure of time to perform at the highest levels more consistently • How to build ‘team’, the most overlooked part of the equation • How to create habits of excellence that your team can use the very next day, so that they can perform under pressure and win!